Maricel Soriano was beaming with joy as she signed a contract with ABS-CBN, marking her homecoming as a Kapamilya after a "long rest" from show business. Soriano's last TV series as a Kapamilya was was "Sineserye Presents: Florinda" in 2009. She has since appeared in a weekly drama anthology and made guest appearances in various programs, in addition to headlining a dramatic film in 2011. "Pag matagal ka nang naka-rest, gusto mo na mag-work. It's been a long time na nag-rest ako. Ngayon na naiisip mo na 'yung mga [bagong gagawin], 'Halika na nga, mag-shooting na tayo,'" the veteran actress told ABS-CBN News shortly after her contract-signing held Monday. "Bukas Nalang Kita Mamahalin," an upcoming Kapamilya drama series co-starring Gerald Anderson and Cristine Reyes, will mark Soriano's comeback on primetime television. The series will also feature Dina Bonnevie and Tonton Gutierrez. "I'm very excited to work with Dina, because it's been a long time. 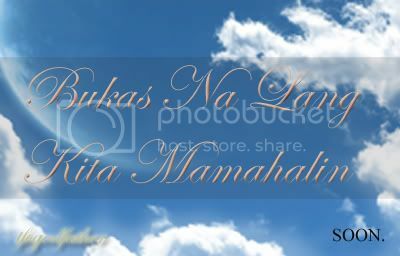 So sabi ko, 'Wow.' Sabi ko, 'How nice naman if i'll be working with Tonton and Dina again," Soriano said. "I'm also excited to work with sina Cristine and Gerald. Of course, anak ko 'yun eh, so very handsome. Si Rayver (Cruz) -- he grew up with us, sa 'Kaya ni Mister, Kaya ni Misis,'" the 47-year-old actress added, referring to the long-running sitcom she topbilled with Cesar Montano. Soriano also starred in the Kapamilya sitcoms "Marry D' Potter" and "John en Shirley." Although her first comeback project with ABS-CBN is a drama series, Soriano said she is "very open" to doing sitcoms anew. "Gusto ko rin 'yun eh. Para iba-iba, 'yung may ganito, may ganun, may ganyan," she said. Referring to her Kapamilya homecoming after a prolonged break from showbiz, Soriano said, "Ang saya-saya ko dahil napaka-warm ng welcome sa akin talaga, at naramdaman ko, at happy na happy ako. Iba 'yung feeling na meron kayong napagsamahan. Taga-dito naman ako eh, matagal ako sa ABS. So masaya ako na nandito ako ulit." 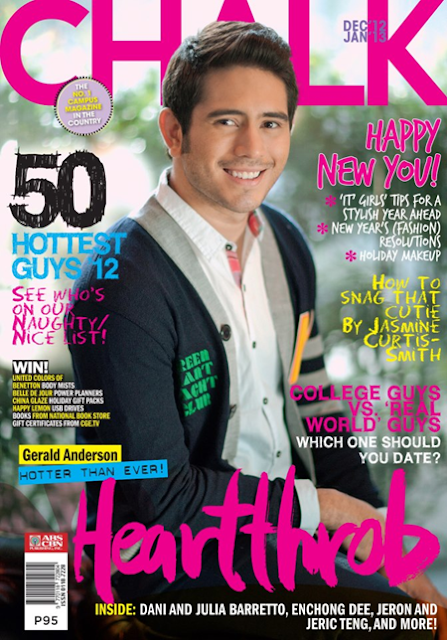 Gerald Anderson is so dashing on the cover of Chalk magazine’s December 2012-January 2013 issue. Gerald wears that cute smile-that-could-melt-anyone’s-heart on the cover photo shot by Paolo Pineda. The Kapamilya actor actually has a newer look which he sported during his Bandila guesting a couple of nights back. He now has a shorter ‘do and an eyebrow slit, a look that he needs for his role in an upcoming movie with Piolo Pascual. 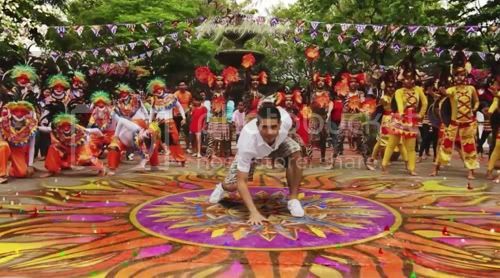 Aside from the movie, however, he also has an upcoming television series with Cristine Reyes and Maricel Soriano, which is set to premiere early 2013. Meanwhile, Chalk’s issue features their list of 50 hottest guys of 2012, as well as tips from the “it” girls for a stylish year ahead, what makeup to wear for the holidays, “How To Snag That Cutie” by Jasmine Curtis-Smith. Copies of the mag will soon be available in all leading stands nationwide for only P95. 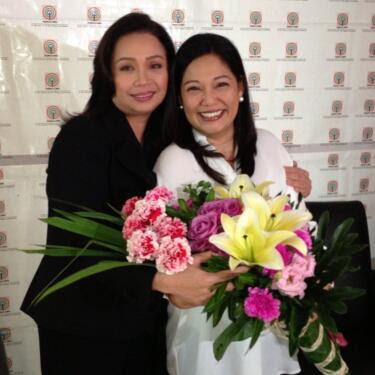 Diamond Star Maricel Soriano officially signs contract with Kapamilya Network today. Maricel Soriano is glad to be back as a Kapamilya artist! 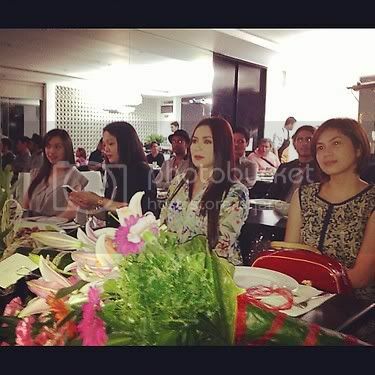 With Maricel during the contract signing at ABS-CBN is her manager Shirley Kuan with Deo Endrinal, Laurenti Dyogi, ABS-CBN Channel 2 head Cory Vidanes, ABS-CBN president and COO Charo Santos-Concio. She will be doing the upcoming teleserye "Bukas na lang kita Mamahalin" with other Kapamilya stars Gerald Anderson, Cristine Reyes, Rayver Cruz, Dina Bonnevie, TonTon Guttierez, and Diana Zubiri and to be directed by Jerome Ponocan Chavez and Tots Mariscal Sanchez. This soap is already on its is production stage where they already started shooting for a month.